Opened in 1959, the Central Freeway was envisioned as the first leg of two crosstown highways ultimately connecting the Bay Bridge to the Golden Gate Bridge. Due to a citizen-initiated “freeway revolt,” just 1.75 miles were built. The freeway extended west from Highway 101 as a six-lane, elevated structure before transitioning to a four-lane, two-level facility. At this point it turned north over the city’s main street, Market, into the Hayes Valley neighborhood just west of the Civic Center. Ramps connected to the east-west, one-way couplet of Fell and Oak Streets, and at the freeway’s northern end it transitioned to a north-south one-way couplet, Franklin and Gough Streets. At its peak, the freeway carried approximately 100,000 vehicles per day. In 1989 the Central Freeway was damaged by the Loma Prieta Earthquake, and the segment north of Fell Street was subsequently demolished. While the California Department of Transportation (Caltrans) began planning a seismic retrofit of the remaining freeway, local officials and citizens, emboldened by the perceived benefits of partial removal of the freeway, began to consider alternatives including a depressed freeway with an at-grade intersection at Market Street. The process accelerated when the segment between Mission and Fell streets was closed for four months in 1996 to demolish the upper, eastbound deck. The gridlock anticipated by Caltrans staff, local politicians and media failed to materialize, and Hayes Valley residents grew accustomed to lower levels of traffic, noise, fumes and vibrations. Around the same time, consensus began to form around a surface boulevard concept developed by Allan Jacobs and Elizabeth Macdonald of the University of California, Berkeley. In 1999, with both freeway retrofit and removal initiatives appearing on the ballot, voters approved the removal of the freeway and the replacement boulevard. The Hayes Valley segment of the freeway closed for good in 2003. Opened in 2005, Octavia Boulevard features four center lanes for through traffic, landscaped dividers, two side, local lanes and two lanes of on-street parking. It connects Fell and Oak Streets to the remaining segment of the Central Freeway at Market Street. At the boulevard’s northern end, a new park serves the newly revitalized commercial corridor of Hayes Street. Parcels freed up by demolition of the freeway are being redeveloped into nearly 1,000 units of housing. Traffic in the corridor, which had stood at 93,000 vehicles per day before elimination of the eastbound lanes, has fallen by more than half to 45,000 per day, with some of the remaining traffic displaced onto alternate routes. In February 2007, just less than 18 months after the opening of Octavia Boulevard, the San Francisco Department of Parking and Traffic published an evaluation of boulevard operations and its impacts on the surrounding area. Additional information was gathered from the city’s Department of Parking and Traffic for this case study. Early indications are that while some congestion remains, replacement with a lower-capacity facility succeeded in reducing total volumes, and enough capacity was available in the surrounding grid to accommodate any distribution of remaining traffic. Among the evaluation’s primary findings was that, despite the reduced capacity of Octavia Boulevard, traffic along detour routes in the adjacent South of Market district returned in the months after its opening to pre-freeway closure levels. Of the half-dozen points observed, three experienced decreases in traffic, while none experienced increases greater than 10%. This, along with the reduction in traffic on Fell and Oak Streets, would seem to indicate a significant reduction in discretionary trips and overall traffic in the corridor, although a survey conducted six weeks after closure of the freeway’s eastbound lanes in 1996 found that just 2.8% of former freeway drivers no longer made their trips, and just 2.2% of trips had been shifted to transit. However, nearly 20% of respondents said that they had made fewer trips since the freeway’s closure. Because the new boulevard did not open until several years after the freeway closure, it was initially perceived as a significant addition of capacity for drivers. During the initial weeks after the boulevard opened, the city increased the number of traffic control officers in the area, and it made a number of adjustments to signal timings until the new system reached equilibrium. The Hayes Valley neighborhood has been transformed from one described as “crime plagued” in a CNN.com profile of the neighborhood to one with stylish shops, restaurants and galleries. According to the Multiple Listing Service, in 1996 the average sales price of a condominium in Hayes Valley was approximately $203,000, or 66% of the average for all of San Francisco. By 2006, the average price of a Hayes Valley condo had increased to $760,000, or 91% of the citywide average. On seven acres of former freeway right-of-way, between 750 and 900 units of new housing are planned. About half would be affordable, and costs would be further reduced by limits on parking. Demolition of the freeway helped spur development of the Market & Octavia Plan, a comprehensive land use and transportation strategy for nearly 400 acres of surrounding neighborhoods. An international design competition for four key residential sites attracted more than 160 entries. Revenues from sales of freeway parcels were used to fund construction of Patricia’s Green, a 16,500 square foot park located where the boulevard meets the retail strip of Hayes Street. Additionally, the tree-lined Octavia Boulevard functions as something of a linear park itself, with its multiple medians and new sidewalk cafes. Peak-hour congestion on Octavia Boulevard has resulted both in backups on Oak Street as well as spillover onto the parallel neighborhood streets of Page and Haight. Adjustment of signal timing has improved the situation somewhat. The city is also considering removal of some on-street parking. The February 2007 evaluation also found some impacts to transit service. Buses on Page Street, which must cross the boulevard, can be delayed by as much as two-and a-half minutes during the morning peak. The most serious objections to replacement of the Central Freeway with Octavia Boulevard have had to do with safety. 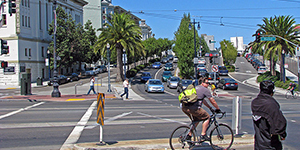 Injury accidents have increased at a rate consistent with increases in traffic, resulting in 2006 in a dubious distinction for the corner of Octavia and Oak streets: It ranked as the city’s most dangerous intersection. Most of these collisions were between cars; however, where Market Street meets the boulevard and Central Freeway, motorists regularly make illegal right turns onto the freeway and sometimes collide with bicyclists. A number of design changes have been made, and more radical reconfigurations, such as colored pavement in the bicycle lane, are under consideration. As originally designed, Octavia Boulevard would have featured a number of unusual design elements. Several, however, were not incorporated in the final configuration. Side lanes are controlled not just by stop signs, but by flashing red lights; yet the 2007 evaluation found a fair amount of noncompliance, confusion and risk among drivers. At 18’-6”, the side lanes are also wider than was intended (although they are narrower than is typically recommended for emergency vehicle access), and their asphalt pavement is not the textured, traffic calming surface that was recommended. Finally, while the side lanes were designed to serve as access routes for local residents and businesses, traffic quickly queued along the southbound side lane at the boulevard’s northern end, resulting in a requirement that drivers turn right. Traffic volumes in the northbound side lane, meanwhile, remain higher than had been hoped. Case Study Source: Department of Transportation, City of Seattle.